It's a whole new world for the Hunter 33 with the launch of the redesigned e33. After five years in production with more than 625 boat launch, the Hunter 33 was redesigned with a sleek modern profile, more space on deck and below and entirely new hull shape featuring a hard chine. Greg Henderson's performance background has helped reshape Hunter's new models by making them more comfortable and easier to sail, not to mention faster. The hard chine first seen on the Hunter 18 last year adds stability to the boat. The beam was also carried farther aft to accommodate the new swim platform design first seen on the Hunter e36. Just like the e36 the "e" stands for extended platform with a swim platform that can be easily lowered to extend the swim area, making boarding easier whether from a dock or out of the water. The deck styling has also been made sleeker with flush mount hatches like the Hunter e36 and Hunter's now signature window line that floods the interior with natural light. The new e33 has a cockpit that is a foot and a half longer than its predecessor. The trademark Selden mast with B&R fractional rig with lazy jacks is standard, and in-mast furling is option. A double-ended mainsheet is standard equipment. 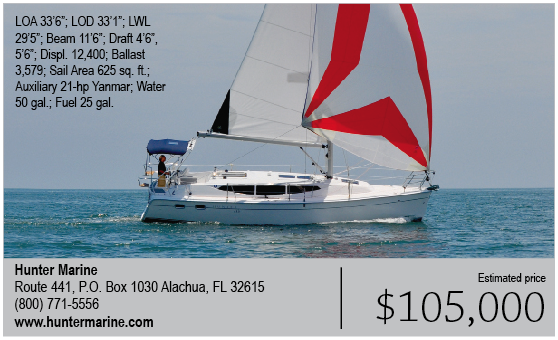 The 625 square feet of sail area should push the boat along nicely, and if the wind quits, the 21-horsepower Yanmar diesel with a sail drive will keep you moving nicely. The new thinking is also evident below-the enhanced design gives the boat a richer feel. The companionway steps that cover the engine area are set up on a gas-assisted shock, making checking the engine easy. The flooring is a material that looks like real wood but withstands heavy wear. The nav station can be made into a seat when not in use. The dinette uses Hunter's unique Easy Lift system that with the flip of a toggle and a few simple cranks, the dinette table lowers to form the a double berth. The galley features Corian countertops, pressurized hot and cold water, microwave and a two-burner stove. Extending the cockpit allows for a larger master aft cabin that features more headroom, a double berth with foam mattress and designer bedding fabrics. The spacious forward cabin has two hanging lockers that create more storage space.